For me, utilizing a vivid imagination is key to maximizing one of Shovelglove's most unique and attractive qualities: the potential for fun. If you don't already do so, try to sharply visualize your routine series of movements as real and add an element of "story" to the workout. Below is an example of a solid routine, in keeping with my online moniker. I do this one in sets of 7 or 14 repetitions, depending on the weight of the Shovelglove I'm using on a particular day. Enjoy ! - Begin with the Shovelglove hanging at your side, then swing up to resting on your shoulder. Feel the pride of a steely resolve as you shoulder your pickaxe and set out for a hard day's work in the mines. Complete the reps on one side, then switch to other side and repeat. - Perform lunges with the Shovelglove resting on your shoulder, first with one foot, then the other, as if walking down a steep mineshaft. Complete the full requisite number of reps on each side. - Swing the Shovelglove overhead and downward, as if striking the stone wall of a mineshaft with a pickaxe. Complete the reps on one side, then switch to the other side and repeat. - Classic shoveling movement. You've broken apart a mass of stone and ore with your pickaxe. Now scoop it up with your shovel and toss it into the rail cart. Complete the reps on one side, then switch to the other side and repeat. - Grasp the Shovelglove just below the head with one hand and near the end of the handle with the other, palms facing down, then hold it horizontally, straight out in front of your chest at arm's length. Squat down and pull the Shovelglove in towards your chest, then stand up and push it back out to arm's length. Imagine that you're holding the handle of your loaded rail cart, and pushing it back up the mineshaft, using the muscles in your legs and upper body simultaneously. Complete the reps on one side, then switch by flipping the Shovelglove so the head is near the other hand and repeat. - Hold the Shovelglove about two-thirds down the length of the handle, one hand above the other, with the head pointing straight downward. Keeping it just a few inches in front of your body, lift the end of the handle straight upwards in front of you, hands passing in front of your face, to full arm's length, then push it back downward along the same path, until your hands are level with your waist. Imagine you are pumping the rope of a great bellows, up and down, firing a massive furnace and smelting precious metal from the ore you mined. Complete the reps on one side, then switch hand position and repeat. - Raise the ale cup. - Grasp the Shovelglove near mid-handle, letting it hang at your side. Perform a curling motion, then hoist the Shovelglove overhead triumphantly. Imagine yourself raising a heavy, wooden tankard, filled to overflowing with cold, foaming ale, as you hail your fellow comrades in celebration of another hard day's work well-done. Complete the reps on one side, then switch hands and repeat. "I don't want my pain erased. As wretched as it is, I need my pain. It makes me who I am. It makes me... 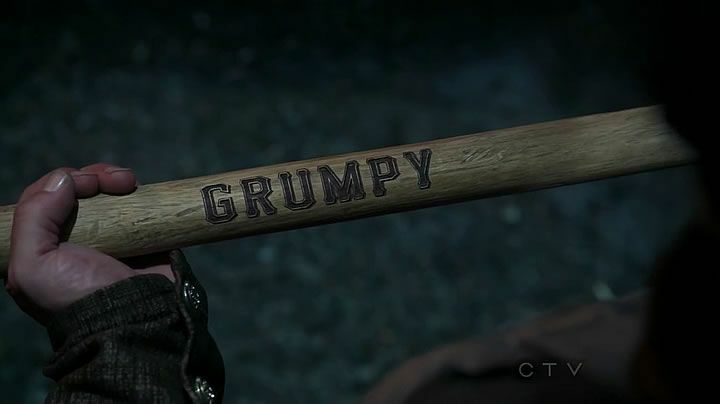 Grumpy." Clever, thanks for putting the "Hi-Ho" song in my head reading your commentary.